Debt Free Duo: Step 1 Complete! 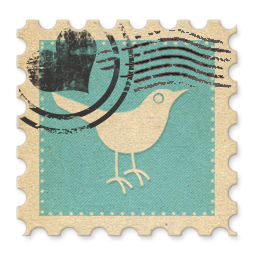 Ms. DebtFree checking in on an exciting-to-me financial update! If you aren't up to speed on my personal debt disaster, check out my first post or Mr. DebtFree's battle plan to tackle my finances. Today marks the end of my first three months of work as a registered nurse. I'm feeling pretty good about the goals I've met at work so far and now I'm finally hitting some of my finance goals! Step 1 in my battle plan was to build my emergency fund of $5,000. 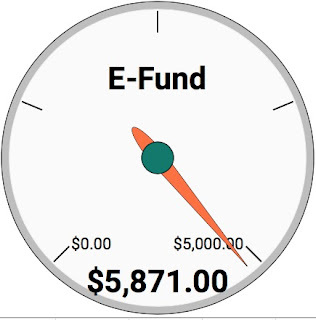 Normally we like to have an E-Fund savings goal of 3-6 months of expenses. Since Mr. DebtFree is my backup plan (thanks, hun!) my E-Fund goal was a lot lower. I'm very proud to announce that I have reached my E-Fund goal as of today's payday deposit! Step 2 was to meet my employer's 401k match and I completed this step when I initially started work. I Got That Loan Money! Step 3 was to start tackling my student loan debt. My grace period (the six months after graduation before payments kick in) ends in December and my first payment will be due in January 2018. Since I exceeded my E-Fund goal with my paycheck, we decided to set up my auto-pay early. Fun surprise: my interest rate decreased by 0.25% when I set up auto-pay! 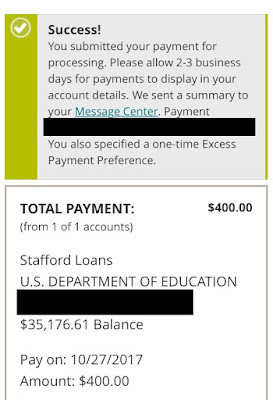 My student loans are through Great Lakes and we selected custom excess payments. This means anything beyond my minimum goes towards the specific loan we're attacking first. After setting up auto-pay I decided to make an extra payment this month towards the first loan on our target list, Loan #4, which has a balance of $2656.34 at a 6.8% interest rate. That's all my excitement for this week so now it's back to my debt-free roadmap! Stay tuned to see when I am able to pay off my first loan!